Contains: Nepticulidae, Incurvarioidea, Tineoidea, Yponomeutoidea, Gelechioidea, Gracillariidae, Phalaena, Tortricidae, Sesioidea, Cossoidea, Zygaenoidea, Alucitoidea, Pterophoridae, Copromorphoidea, Thyrididae, Pyraloidea, Bombycoidea, Noctuoidea, Rhopalocera, Drepanidae, Geometroidea. The Heteroneura is a major clade of Lepidoptera, basally characterised by the coupling of the fore and hind wings (though this has been lost in some derived subgroups). Major subgroups include the leaf-mining Nepticuloidea, some species of which are among the smallest lepidopterans (Grimaldi & Engel 2005). Nepticuloids include the Opostegidae, which are usually white with a dark pattern and have their wings coupled by long, curved pseudofrenular bristles curving around a ventrally expanded M vein in the fore wing (Nielsen & Common 199). Andesiana is a genus of relatively large, heavy-bodied moths found in southern South America, characterised by an elongate second labial palpal segment and a pheromone-dispersing pouch on the male tibia associated with a femoral hair pencil (Davis & Gentili 2003). 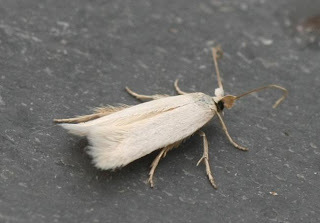 Tischeria includes very small, brown or blackish-grey moths with a distinctive frontal tuft projecting over a triangular face. The Palaephatidae are small to very small moths found in South America and Australia whose larvae start life mining in leaves of Proteaceae and later live in shelters formed by joining adjacent leaves (Nielsen & Common 1991). The clade Ditrysia includes the majority of the Heteroneura and indeed some 98% of the species of Lepidoptera, united by the presence of an internal passage between the copulatory tract and the oviduct. The Simaethistiidae is a small, poorly known group of basal ditrysians found in eastern Asia and Australia. Major clades within the Ditrysia include the Apoditrysia, characterised by the presence of two specialised apodemes with short, large bases on the abdominal sternum. Within the Apoditrysia, members of the Obtectomera have pupae with abdominal segments 1–4 immobile and without a dorsal row of spines on the tergites. Many of the larger lepidopterans belongs to the clade Macrolepidoptera, characterised by complete loss of the vein CuP and crochets on the larval prolegs arranged in a crescentic series on the inner side (Grimaldi & Engel 2005). Synapomorphies (from Grimaldi & Engel 2005): Female genitalia with gonopore separate from ovipore, no connection between the two tracts; reduction in branching of Rs veins in hind wing; wings coupled with frenulum and retinaculum; loss of abdominal sternum 1. [C74] Common, I. F. B. 1974. Lepidoptera (moths and butterflies). In: CSIRO. The Insects of Australia: A textbook for students and research workers. Supplement 1974 pp. 98–107. Melbourne University Press. [DG03] Davis, D. R., & P. Gentili. 2003. Andesianidae, a new family of monotrysian moths (Lepidoptera: Andesianoidea) from South America. Invertebrate Systematics 17: 15–26. [M86] Meyrick, E. 1886. On some Lepidoptera from the Fly River. Proceedings of the Linnean Society of New South Wales, series 2, 1 (2): 241–258. [NC91] Nielsen, E. S., & I. F. B. Common. 1991. Lepidoptera (moths and butterflies). In: CSIRO. The Insects of Australia: A textbook for students and research workers vol. 2 pp. 817–915. Melbourne University Press: Carlton (Victoria). [NB03] Nieukerken, E. J. van, & C. van der Berg. 2003. A new Stigmella feeding on Urticaceae from Guam: First records of Nepticulidae (Lepidoptera) from Micronesia and Polynesia. Invertebrate Systematics 17: 27–37. [WRM02] Wiegmann, B. M., J. C. Regier & C. Mitter. 2002. Combined molecular and morphological evidence on the phylogeny of the earliest lepidopteran lineages. Zoologica Scripta 31 (1): 67–81.